Last year saw the release of the NARS Audacious Lipsticks and I'm so impressed with them. I want to show you the three that I own and tell you a bit more about the formula. There are 40 gorgeous shades so there's something for everyone. It was so hard narrowing down my choices each time I purchased one! The formula is a satin finish which I absolutely love. It doesn't leave the lips really dry but doesn't look too glossy either. It stays in place on the lips for hours and feels really comfortable. I find these to be a great choice for nights out as the bold colour lasts through many drinks and even through eating food! Each shade I've tried is extremely pigmented too. You get a beautiful bold colour in one smooth swipe of the bullet. The shades I have are Janet (dark pinky berry), Angela (pink with a hint of purple) and Michiyo (hot pink) and I love them all. I definitely want to add more of these lipsticks to my collection. Another plus point about these lipsticks is the packaging. It's not the usual matte, rubberised casing. It's a sleek, smooth metal casing that doesn't attract fingerprints like the usual NARS packaging. It also has a magnetic lid which I think is a nice touch. These definitely feel and look more luxurious so I would 100% say they are worth the £24 (Space NK) price tag. If you want to see what Janet looks like on the lips, check out my Modern Autumn Makeup post here. It was the first one I bought and I've worn it quite a bit since I got it as it's the perfect shade for Autumn/Winter. I think Angela and Michiyo are going to be great for Spring/Summer. Hope you've enjoyed looking at my little NARS Audacious collection. Have you tried these lipsticks? Which one is your fave? 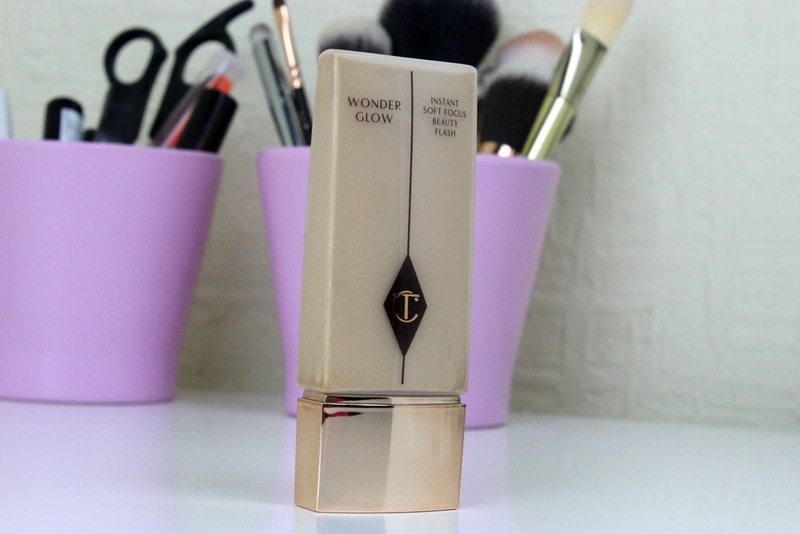 If you're looking for something to give your skin a glow under foundation, I have just the thing! 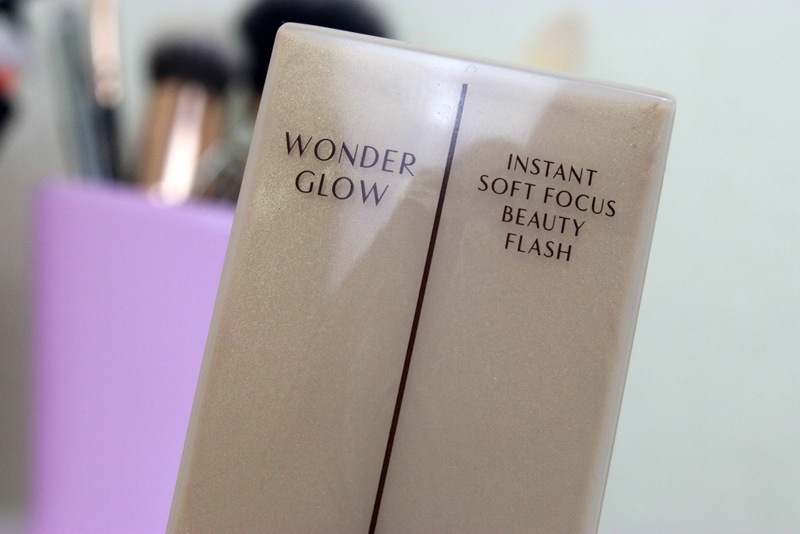 The Charlotte Tilbury Wonder Glow Instant Soft Focus Beauty Flash is a product I won in a giveaway. If I'm honest, it's not a product I would have picked myself, even though I've lusted after pretty much every other product by Charlotte Tilbury. The reason I wouldn't have picked it, is that it's quite a dark golden product that looks like it would be awful for my porcelain skintone. Don't worry, I was totally wrong! Yes, this is a warm toned, golden liquid that is full of shimmer but it doesn't look dark on my skin at all. It blends out to be colourless on my skin but it leaves behind a beautiful shimmer. It is far too glittery on its own though. That's why I use it under foundation. 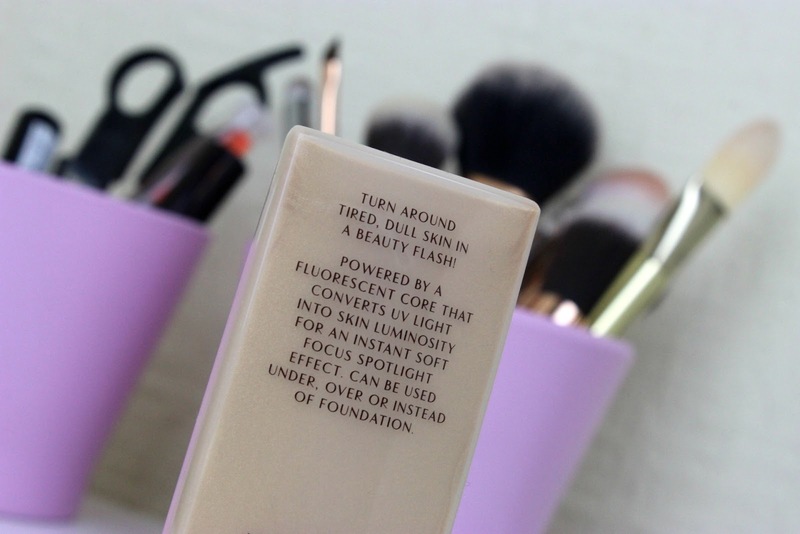 It creates an extremely smooth base for foundation which is absolutely perfect for my normally dehydrated skin. 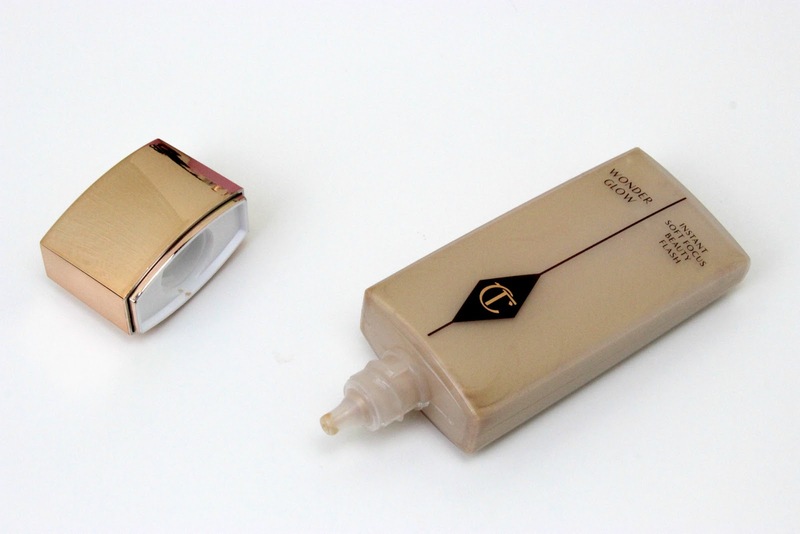 This allows makeup to look a lot more flawless as it feels quite moisturising. It's really lightweight though and doesn't leave my skin greasy at all. When you've applied foundation on top of this, you don't see any of the shimmer, only a gorgeous glow and radiance. I really love wearing this as a foundation primer and I would totally pay the £38.50 (Selfridges) to replace it if I ran out. I can tell this is going to last me for a long time though as you only need to use a little bit and the nozzle doesn't let you dispense too much in one go. Amazing stuff! Do you use anything similar under your foundation? 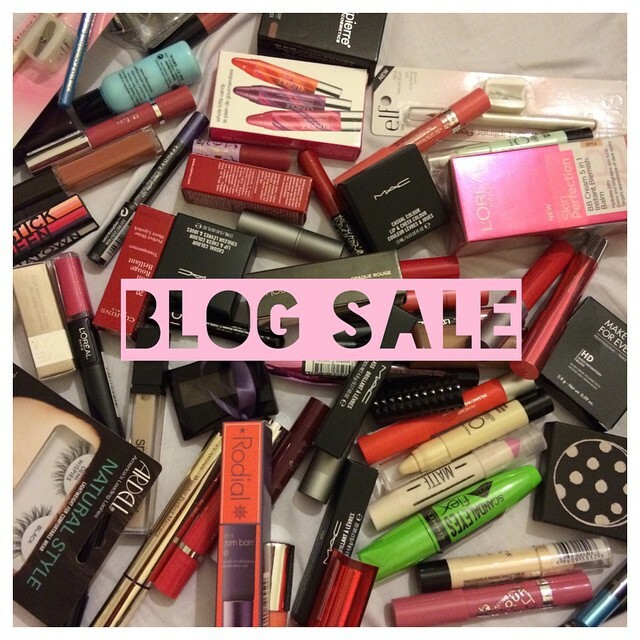 If you've seen today's post then you'll know just how out of hand my makeup/beauty collection is getting so I've decided to add some more items to my blog sale! You can check the blog sale out here if you fancy a little browse. Back in November 2013, I bought the shorter, wider Ikea Alex to house my huge makeup collection but I felt that I needed something for all of my other beauty bits so this New Year's Day I made a trip to Ikea to buy the taller Alex. A couple of people on Instagram showed an interest in seeing my makeup collection so I thought I'd do another post so you can see how I've got everything arranged. I could have arranged things a bit tidier but this gives you a general idea of what I've got and where it is. There are some items missing from the photos as I do tend to leave a few things lying round plus the bulk of my brushes, mainly Real Techniques, are missing from the photos as they were well (over)due a wash.
How do you like to store your makeup/beauty items? How beautiful is this eyeshadow palette?! I spotted this gorgeous pink sequinned beauty just after Christmas and I desperately wanted it but I'd already spent my Christmas money so walked away from it. I then started seeing it appearing on a few blogs so that made me want it even more. Last week after having my hair done and making a little detour through Boots on the way home I decided to just go for it. 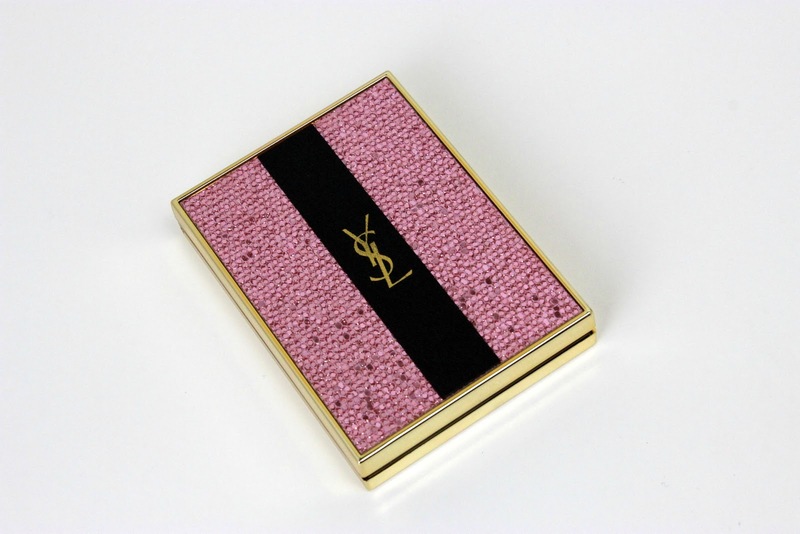 All YSL packaging is stunning but the pink sequins makes this extra special! This is the Palette Ombres de Jour for Spring 2015 so I guess knowing it's Limited Edition made me want it more too. Although I probably could have bought this for the packaging alone, the eyeshadow shades inside are beautiful too. Phew! All of the shades have shimmer in them which I love. The soft brown and more bronzey brown are very wearable shades but I just love the additional colours which I wouldn't have thought to wear with those browns. The top right shade is a gorgeous creamy white with hints of pink shimmer. The pink in the bottom right is absolutely dreamy, it's such a lovely shade! The black in the centre has more of a matte base but is packed with hot pink shimmer. All of the shades are very smooth and whilst they aren't the most pigmented eyeshadows I've ever swatched, they still pack a punch of colour and I'm impressed with them. I haven't tried these on the eyes yet as I have a ton of other makeup to get through but I'm looking forward to trying a look with these colours. This is probably the prettiest palette I own now and I can't stop staring at it! I forgot to mention there's a huge mirror inside, the whole size of the lid, so it's good for applications on the go too. Have you got your eye on any Spring collections? When I visit Lush, I'm automatically drawn to the pink, girly, glittery, sweet scented products. I'm a massive fan of those and don't often check out things that don't fit into those categories. When the Newcastle store had its revamp, I was given a selection of goodies to try and one of those was Karma Kream*, a hand and body lotion. I've never given any of the Karma range a try as I just assumed it wouldn't be for me. The main ingredients of the Karma range are orange, patchouli and pine, so you can probably see why the sweet fiend in me overlooked these. One sniff of the Karma Kream* and I was amazed! It actually does have a sweet scent! Who knew?! It's very orangey but it's also quite creamy so I think it smells a bit like orange chocolate. More orange than chocolate but if you like the sound of this, you honestly need to smell it for yourself! Being a lotion, it isn't too heavy on the skin and it sinks in really quickly leaving the skin feeling immediately moisturised but not sticky or greasy. The scent really lingers on the skin so you're going to be sniffing yourself all day when you've got this on. You may get some strange looks but who cares when you smell this good?! The moisturisation really lasts too. I'm so glad I was given this product and it really makes me want to go and explore more things in Lush to find more unexpected goodies. I'm supposed to be saving money but all I can think about is what other makeup I want! I'm terrible! 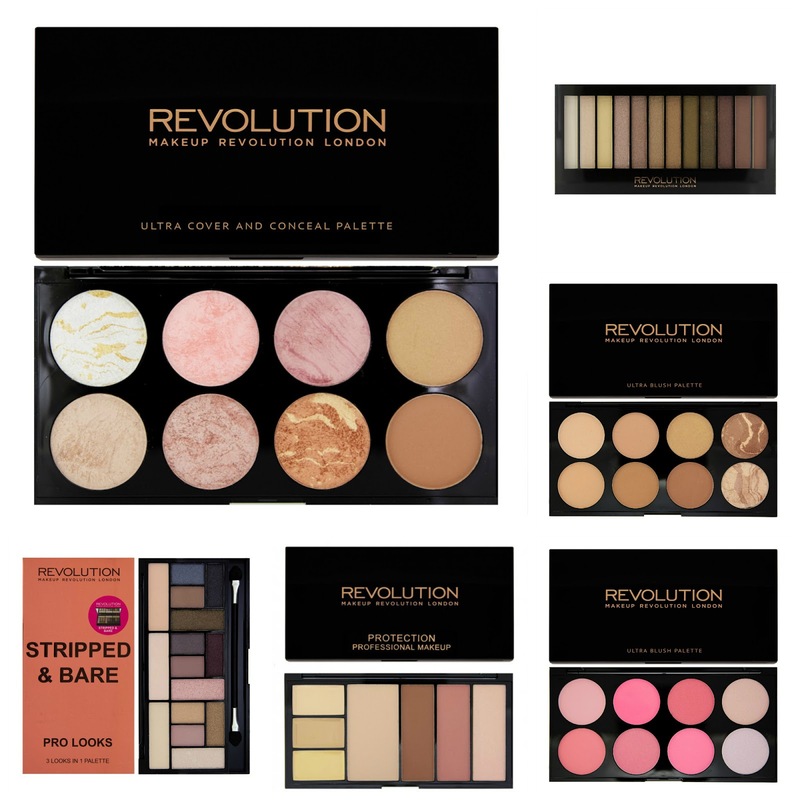 I featured Makeup Revolution in my 2014 Favourites as I've been loving their palettes. They are constantly bringing out new products that always get me excited and wanting them! Ultra Blush and Contour Palette in Golden Sugar - the shades in this palette look really unique and it looks amazing going off the swatches I've seen on other blogs! Iconic Dreams eyeshadow palette - Although I now have quite a few eyeshadow palettes from Makeup Revolution, I really love the colours they have put together in this palette. I think they would really make my green eyes pop! Ultra Blush Palette in All About Bronze - I really got into bronzing last year so I keep getting tempted by this palette of bronzey goodness. Ultra Blush Palette in All About Pink - I love pink and I love their Hot Spice blush palette so I just know this one would be amazing too. Protection Palette in Light - This brand new product looks very interesting. It's a great idea to have concealers, pressed powder, bronzer, blush and highlighter all in one palette. Pro Looks Palette in Stripped Bare - This is also very new and I love that shades have been grouped together to be used for different looks. I really like the shade selections in this palette. 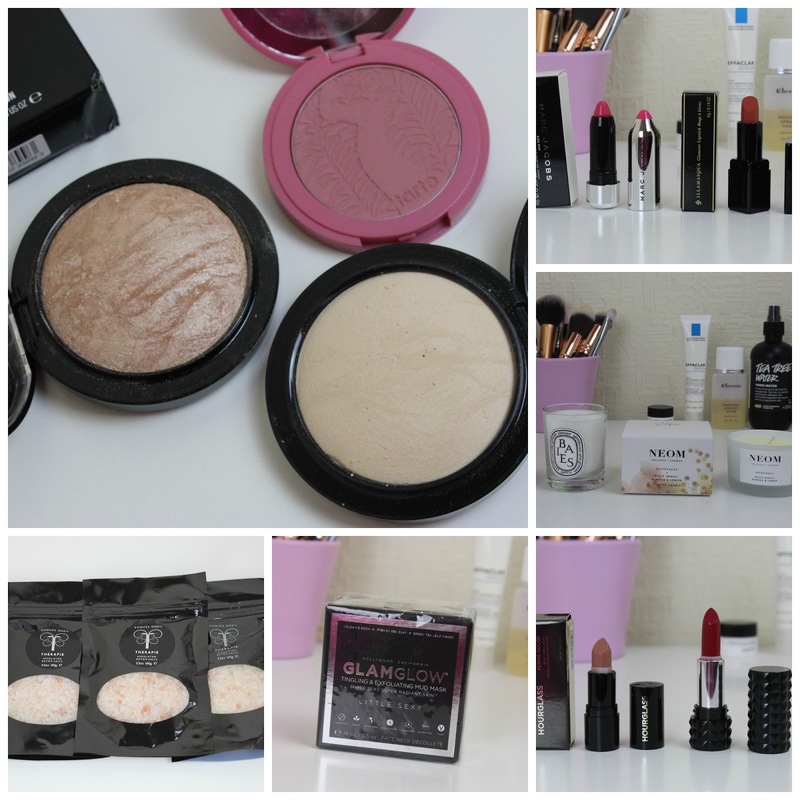 What Makeup Revolution products are you lusting after? I'm extremely guilty of buying makeup in large quantities, putting it away nicely (or leaving it lying around in carrier bags...shhh) and then forgetting about it as I've bought even more stuff. Seeing as I need to save a rather large amount of money this year, I'm going to get round to actually trying more products! I meant to write this blog post back in November but I never got round to it so I thought rather than waste the photos, I may as well do it now. So this was the first time I used these products but I have used some of them since. I'd been desperate to try the Tarte Amazonian Clay Full Coverage Foundation for ages so I bought it in one of my many Sephora hauls. I don't know why it took me so long to try it though! This is a very light feeling foundation so it is very comfortable to wear. After a few rubs, it's completely dry so you have to work quite fast with this one and if you have dry skin like me, you need to spend a bit of time preparing the skin with moisturisers and primers first. You can get a medium to full coverage look with this but bear in mind that when my photos were taken, I had some really bad, big blemishes on my chin so this doesn't cover them completely. It covers flat blemishes and redness well though. I bought the lightest shade Ivory but it looks quite yellow and dark in my photos. It didn't look like this in person so not sure what's going on there. I'm going to have to try this in proper daylight next time I think! After hearing so many rave reviews of the By Terry Ombre Blackstar, I thought I may as well try it! I went for the shade Misty Rock, a gorgeous cool toned, pale, pinky-purple shade with silver shimmer running through it. I really like this as the stick format is really easy to use and the product is very smooth and applies very well to the skin. It's extremely pigmented and I find this product to be very long-lasting too. I love wearing this on a night out. When I tried the Charlotte Tilbury Full Fat Lashes Mascara for this makeup look, I fell in love straight away and it ended up in my December Favourites. The fibre brush on first inspection didn't look like it was going to do much but then I realised it is packed with bristles all the way round so it's a fantastic all-rounder at volumising, separating, lengthening and curling the lashes. This really opens up the eyes when you use it and the brush even grabs all of the tiny hairs. I've mentioned before on my blog that I haven't quite got the hang of doing eyebrows yet. I mostly go for the clear brow gel look! When I spotted the Tarte Amazonian Colored Clay Tinted Brow Gel, I really liked the look of the brush as it's super tiny. This means you are able to really build up the definition slowly and go for a softer look if you're not used to doing bold brows! The shade Taupe seems to be a good match for my hair colour too. A bit of a random purchase from one of my Sephora hauls was the Marc Jacobs Shameless Bold Blush in Outspoken. The packaging of this is very luxe and even comes in its own little pouch. I was attracted to this blush as I really like the lilac toned pink shade. Disappointingly, the blush is not very pigmented so it takes a lot of work to get the product on your face. I would say this is good if you are going for a subtle wash of colour on your face or if you have more time to build up the colour. I do still like it though but the pigmentation is something to consider when buying it. Especially if you have a darker skintone than me as it might not even show up. I decided a darker berry lip would go nicely with the purple tones I'd used for my eye and cheek makeup so I picked the Buxom Full Bodied Lipstick in Menace. This is a sample size from a Sephora value set. I really like this lipstick as it's super pigmented and has a glossy look to it. It feels very hydrating on the lips too. I realise this was a very American product heavy post so I will definitely include more products that are easily accessible in the UK next time! Do you like the look of the products I've used in this post?